You might know Andy Rihs as the boss of BMC Racing but he’s become wealthy by creating a hearing aid company, Sonova. 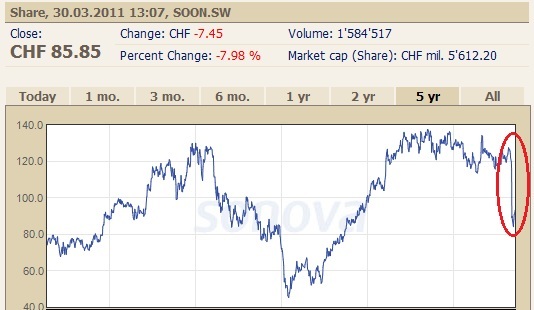 A Swiss company, Sonova is the world’s leading manufacturer in this sector. If you haven’t heard of it, you might have known it under its previous name of Phonak. The company was started by cycling aficionado and wealthiest man in cycling Andy Rihs, it’s grown from a tiny start-up into a medical electronics giant. Only the company took a hit today with its CEO and CFO both tendering their resignations whilst Chairman Andy Rihs is to step down as a result of what the Financial Times calls “an insider trading probe”. Why? Well companies on most stock exchanges around the world have a period prior to announcing their results when staff are forbidden from buying or selling the company’s shares. This “close period” or blackout is to stop corporate insiders with knowledge of the results from taking advantage of their inside info to profit from share trades, it’s one tool to stopping the crime that is insider trading. But just eight days before Sonoma announced bad news to investors some corporate insiders were selling their shares. An investigation by lawyers did not reveal Rihs knew of the upcoming investor warning but nevertheless it’s a flagrant breach of responsibility and stockmarket rules and its cost Rihs his job. Similarly the CEO and CFO who were running the business should have issued an internal warning not to trade shares plus there were other procedural failings. You can read the full story at bloomberg.com. It all means a mess for a company, the three most senior people on the board get decapitated in one day. I won’t comment on the intentions of Rihs, clearly review conducted by lawyers hired by Sonova is not the most independent of means but this is now a matter for the Swiss regulators and authorities. One to watch. Rihs remains fabulously wealth and, assuming this doesn’t become a criminal matter, this story will probably prove an embarrassment in the close-knit Swiss corporate circles and an expensive lesson in not following stockmarket rules. I suspect Rihs is more interested in watching De Ronde this Sunday, rooting for Greg Van Avermaet and Alessandro Ballan as well as hoping Cadel Evans can bring more wins in the weeks and months to come. BMC, the bike business is separate and so the net effect on cycling will hopefully be untouched by the corporate bungling. But as ever I like to cover the business issues relating to the sport as well as the related stories. The irony here is that if Rihs has had to step down, media reports now say the company is weakened and could become a takeover target. Were this to happen then someone might be paying a premium to buy out Rihs, allowing him to cash in on the business he created many years ago. I hope not. If anything this just looks like a stupid bungle. He is very wealthy and the sale of shares involved amounts to a drop in the ocean, to have done this deliberately flouting the rules would amount to idiocy. But like I say, it “looks” like this, I don’t know any more. Embarrassing and a bad day for what is an impressive growth story. He’s not leaving the company, he’ll stay on the board. Behind all the romantic pictures of a beautiful sport, lay the back room dealings of swindlers, lies and cheats. It was almost a given for many decades, that whatever bill of goods you were sold, you’d better have other options. Heck inrng, you could do a whole piece on deals gone sour. Or staff making their way through seasons on bread and tomato soup, because the money was never there. Man I love this sport. I’ve just watched the Swiss news: We’re talking about share worth 37.5 millions Sfr, about 29 million EUR. However, Rihs has bought the shares back for the same price today. The TV station also interviews Sonova workers standing in front of the company who said they hoped Rihs would continue as the company’s boss because “it’s his company, he is the company”. Andy needs to ball up and offer Cadel’s wife a Ferrari if he wins the tour. By the way I think he still owes Landis a Dukes of Hazard Charger. Starr: well it adds to the drama but riders deserve decent employers. Alex: yes, a lot of money… but relatively small change for Rihs, he is worth billions. Leif: good motivation. The Evans’s seem a team, she certainly helps a lot. leif – by my calculation rihs would only have to sell just over a 100 shares in order to fulfil such motivation for the Evans family. Yyeeeeee-Hhhaaaaaaa as they say in Idyllwild……. I would love to see him pull a Tapie with the classiest lady of cycling. Come one Rhis…I think Chiara is worthy! And get Floyd a Dukes of Hazard Dodge Charger…the guy just wants to get rad.